This is the end of the honeymoon period for secret space octopus Jeb Hawkes, the last day of his almost unbroken four-week streak. He’s appeared in 18 of the first 20 episodes since his debut, completely dominating the last month of story. Quentin’s tragic reunion with Amanda, the struggle to find a cure for Chris’ lycanthropy — it was all swept offstage, so everybody could plot and scheme and cry and scream and kiss and kill the monster man. But not anymore. 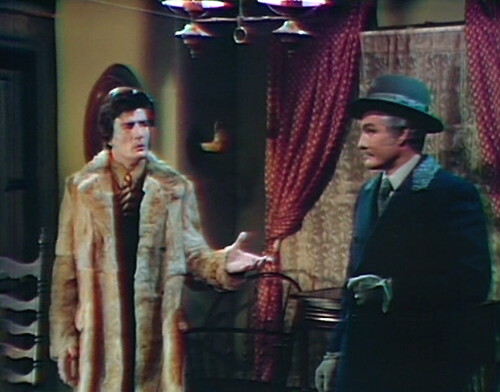 After this, Jeb sits out for a few episodes, while the old crew reassembles behind his rival, Barnabas Collins. Most of the important fan-fave characters are lining up on Barnabas’ side — Julia, Quentin, Maggie, and soon Angelique and Willie. In his corner, Jeb has Carolyn, Megan and Bruno, plus assorted non-combatants like Elizabeth and David. I don’t know which side Mrs. Johnson is on; she might be starting her own faction, for all I know. ¡Viva Mrs. Johnson! For a soap character, you’re only as good as your scene partner; that’s why supercouples and long-term nemeses are so important. You can’t just walk around and have average conversations, not on this show — at least, not anymore. That’s why Angelique keeps turning up in every time period, because Angelique and Barnabas have literally never had a boring conversation. Jeb’s on solid ground when he’s interacting with Carolyn, because she’s got impeccable history and range, but if he leans too much on non-pivotal newbies like Megan and Bruno, then he’s going to hit rough waters. What he needs is a solid connection to a really interesting character, and oh dear, here comes one of those unfortunate February surprises. It’s Nicholas Blair, the boss from Hell, who darkened our doors in the summer of ’68, and left the canvas in disgrace five months later. He showed up towards the end of the dull Dream Curse storyline as a mysterious malefactor with power over Angelique, offering promises of intriguing new plot twists with every arch of the eyebrow. But then it all went wrong, somehow; he managed to clamp onto the Frankenstein story, which quickly ground to a halt. It turned out Nicholas didn’t really have the brilliant master plan that he kept teasing us with, and he obstinately refused to take any action that might upend the status quo and move things forward. And so he suffered the fate of all storyline speed bumps: a sudden and inglorious exit, engulfed in flames and pursued by a bear. So it’s not exactly the fanservice of our dreams, having Nicholas turn up with the same sales pitch as last time. Two years ago, he was the guy who’d been secretly masterminding Angelique’s return to Collinwood, which up to that point we didn’t realize needed a master to mind it. But Mr. Blair swaggered in like a boss, scattering performance reviews in every direction. It looked a lot then like it does now. “Shall you give your explanations now, for the crimes you have committed?” he demands. “For the chances you have taken, the power you have usurped?” Then we cut away for a Collinwood scene, and when we come back, Nicholas is still browbeating Jeb. Now, you might recognize that list of accomplishments as being the four most interesting plot points of the last month. Nicholas is here to get the Leviathans’ ascension back on track, i.e. the cautious unfolding of a plan that we already know pretty much everything about. And then — even worse than worst of all, apparently — Jeb has decided recently that he doesn’t want to disappear off-camera and turn into a sound effect anymore. He wants to win Carolyn’s love in his human form, and then spring the concept of turning into gigantic tentacle monsters during the honeymoon, which I for one would be eager to see. “Do you think I’m going to let you stand in the way of the return of the Leviathans?” Nicholas shouts. “This is my idea!” So that’s a thing you don’t really want to say, when you’re trying to turn around a sagging storyline. Nicholas doesn’t want to change the story, and make it more interesting — he just wants to take credit for it. 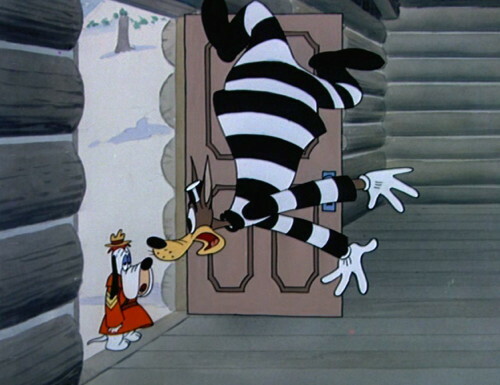 And there’s Nicholas standing on the porch, like Droopy Dog in Northwest Hounded Police. Now, that’s fun, I have to give them that one. If they want to do the rest of the episode as a Tex Avery riff, where Jeb zips out the door and takes a plane to a boat to a bicycle, finally cross-country skiing to an igloo at the North Pole, and finding Nicholas inside, leaning up against the wall and casually regarding his fingernails, that’s fine with me. Go and do that. But if all we’re leading up to is sending Jeb into the back parlor to huff and puff, then I’m not sure why we need a whole extra guy to do it. And that’s pretty much all that’s on tap today, just Nicholas Blair, walking around and pretending to have a plan. Also, Carolyn has the same dream that we’ve already seen twice, where Jeb basically tells her that he murdered her father, and she says she doesn’t understand what he’s getting at. If you ask me, dragging Nicholas into this is a sign of desperation, a poker tell that the writers want to postpone any story progress. Later in the episode, Nicholas tells Bruno that he’s responsible for making sure nobody kills anyone, although Bruno was specifically introduced as an assassin, so I don’t know why he’s now being tasked with the opposite. Still, that’s Mr. Blair’s modus diabolus: to poke a stick in the spokes of the wheel of fortune, and stop it cold. Okay, great, says the viewing public. Look, why don’t you get back to me later, when you’ve given this some more thought? The Ralston-Purina lamp flashes on and off, several seconds before Megan walks over to turn it on. When she gets there, it turns on before she can touch it. In Carolyn’s dream, Jeb mysteriously disappears and Carolyn looks around for him — but we can see him, standing not quite far enough to be off camera. 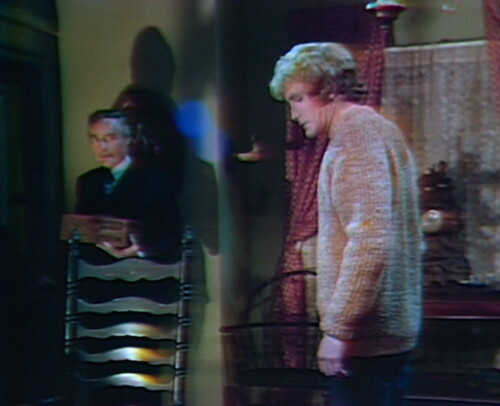 When Carolyn turns away from the coffin, the edge of the burlap grass is clearly visible. When Jeb visits Collinwood in act 3, Megan is supposed to be hidden in the darkness until it’s time for her entrance — but you can see her ankles as she waits at the top of the stairs. Dennis Patrick is credited with playing Paul Stoddard, but his only “appearance” is a still photo. His actual last episode was a month ago. 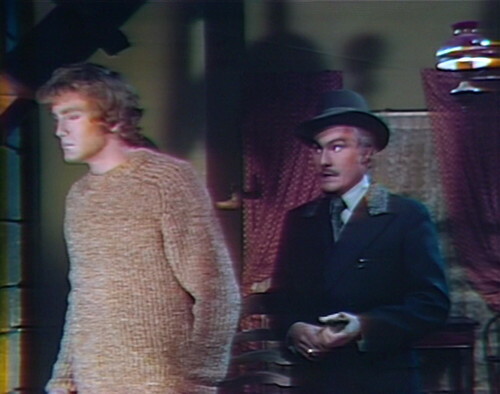 I assume somebody is the stand-in playing Lawrence Guthrie’s body in the dream, but I don’t know who it is. It might be a mannequin. There’s an exciting scene transition, at least for me, when we fade in the first act from Jeb’s carriage house to the Collinwood drawing room. The first thing we see is a close-up on my favorite prop, the Ralston-Purina lamp. There’s another one next week, too. But Nicholas is so much fun. It wasn’t until I read your blog that I realized how bad his track record really is. Nicholas always sparkles with mischief – I love it when he shows up! He brings the fun like Uncle Arthur did on Bewitched. I guess it’s a local ordinance in Collinsport that any grave has to be dug up at least once. C’mon, Paul Stoddard looking like THAT when the coffin opens? That is good scary, friends. Just how I want to look when it comes time to box ME up, none of that ‘serene sleeping, “oh, he looks so natural”‘ stuff. That should put the ‘fun’ in funeral! You think? I think the photo is so obviously a photo that it looks ridiculous! And Paul’s smile looks not so much vengeful as it does like the smile of someone on vacation—which of course he was. 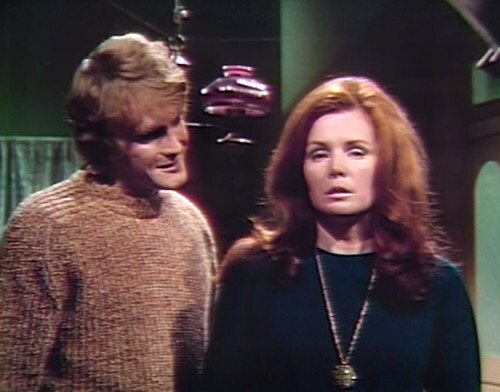 For the record – we seem to be straightening out the record a lot today – Dennis Patrick might not so much have been on vacation as working on the movie “Joe,” which will be released nationwide on Wednesday July 15, 1970 (on the same day as the broadcast of episode 1058). I do not know the production schedule of “Joe,” so I do not know what stage the movie was at in February. But I do remember somebody reviewing “Joe” after it came out and condescendingly marveling at the good performance turned in by a mere soap opera actor. Many of the outdoor scenes in “Joe,” especially at the climax, are clearly filmed during the winter with real snow on the ground. I hear Mrs. Johnson’s team has access to the best cigarettes. And if any food still exists, they probably know where it is. Unfortunately she boiled it to death though. Great commentary as usual, Danny. And I wonder how many readers picked up on your clever little Shakespearean reference. 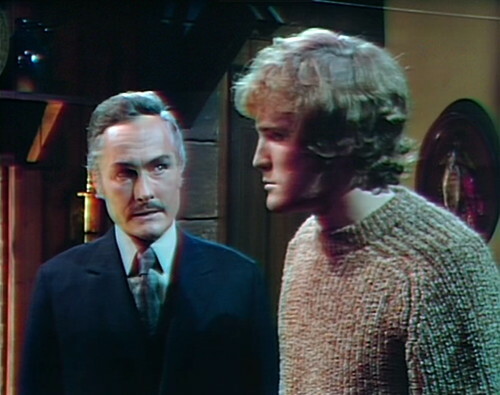 Nicholas is right about the stupidity of turning Barnabas back into a vampire, an ultimate act of cutting off your nose to spite your face: punishing your enemy by making him a more powerful enemy. Just for the record. All that talk that Philip would hang for murders he didn’t commit? There was no capital punishment in Maine, and hadn’t been since the 1880s. Picky, picky, picky. Next thing you’ll say was that there were no witchcraft trials at the end of the eighteenth century…. That’s a coincidence, because I’ve been reading another Dark Shadows blog, called “Dark Shadows Before I Die.” It’s just now in the middle of the “Murder of Bill Malloy” sub-plot, and it mentions the scene where David taunts Roger by telling him the killer will be hanged, and Roger matter-of-factly telling him the same thing, that there are no hangings in Maine. Oh, I hadn’t seen that before, neat.